NEET-MDS is just two months away. 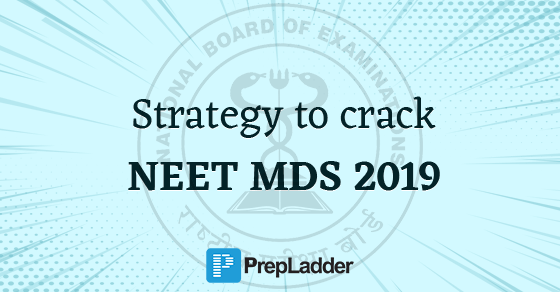 It is time to put strenuous effort and dedication & give 100% to your NEET MDS exam preparation. In order to make your preparation more effective and help you to grab a seat in the desired specialty, we have come up with an effective strategy. Owing to scarcity of time, devising/ revising your already made study plan is of utmost importance. Thoroughly go through your study plan and make changes according to the requirements. Sticky notes are very helpful to retain & revise difficult concepts, keywords and key points. Sticky notes must be placed at such position, where you at view that at maximum number of times. Mnemonics serve as a great aid to retain difficult keywords and points. Use Mnemonics whenever possible to retain important and difficult keywords and concepts. Owing to the scarcity of time for NEET MDS exam, it’s time for SMART WORK. You must focus on the important & high yielding topics by carefully analyzing 5-6 previous year papers of AIPGDEE. Sitting in same position can result in boredom. Taking shorts breaks regularly between the study hours will help to boost your energy level and keep you in a vibrant and motivated for study. Your aim in the last two months should be to enhance your speed and accuracy. In order to improvise your speed and accuracy, try to attempt as many Online Mock Tests as possible. You must also solve NBDE papers since there are quite a good number of repeats from the previous papers. Try to go through 3-4 papers each day in the last 2 months in order to complete them. Make sure to solve questions from Mudit Khanna book since the questions are regularly repeated from this book in NEET MDS exam. Make it a point to revise and go through all the volatile and difficult topics maximum number of times. This will facilitate longer retention. To make judicious use of time, you must stay away from distractions especially cell phones, laptops and social media. Efficiently implementing the aforesaid strategy will surely help you secure and grab a seat in your dream Dental College. Keep Following PrepLadder for more updates..